Howdy Hoo Jaderbugs! It’s one of those days. I am sitting here not sure “what” to do when I have “all” of the time in the world. Well not really all of the time in the world but let’s face it…when there is a major Hurricane going on and you can’t leave your house for a couple of days it kinda puts you in a cray cray mood. I apologize if at ANY point I don’t make any sense. I really have not made anything today so I figured it would be a great time to go back and take a look at some of my FALL crafts that I did last year. I always enjoy doing this because sometimes I forget what I have done. It’s funny because I have changed so much from ONE year ago. From my techniques, pictures, editing, settings and tons of other things. I remember when I did ALL of these crafts. It was in the MIDDLE of my 100 days of Martha countdown. Maybe that is why I didn’t have the “best” pictures like I do now. I was stuck in my studio crafting like a FOOL late at night with NO natural light. But all together you can still get the idea of the craft! I hope you have fun with these and get ton’s of inspiration. Stay tuned later on for a Halloween throwback post! That one will be FUN. On the bright side. We still have electricity. That my dear is a HUGE +. Let’s all take a trip down FALL lane. I had so much fun doing this craft. I think it’s perfect for the fall holidays. It has a soft glow to it when the light is on and the pretty green makes it feel “fall-ish”. 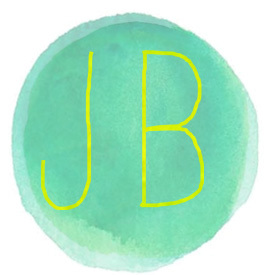 One thing that I like to share on my blog is ways to SAVE moolah! 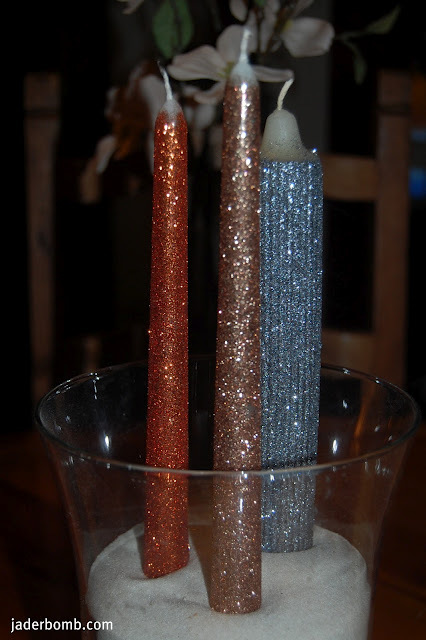 Yeah, you could absolutely go out and buy tons of glittered candles, or you can make your own for half of the price. On the bright side. You can pick out your own glitter colors. I know this looks a little “Halloween-ish” but if you visually take off the spider we can throw it in the FALL category. 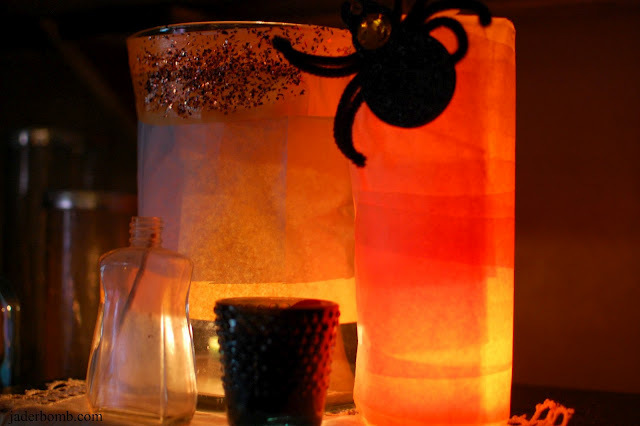 You can use any color tissue paper and it’s actually great for any occasion. I remember doing these and thinking to myself how amazing they were. 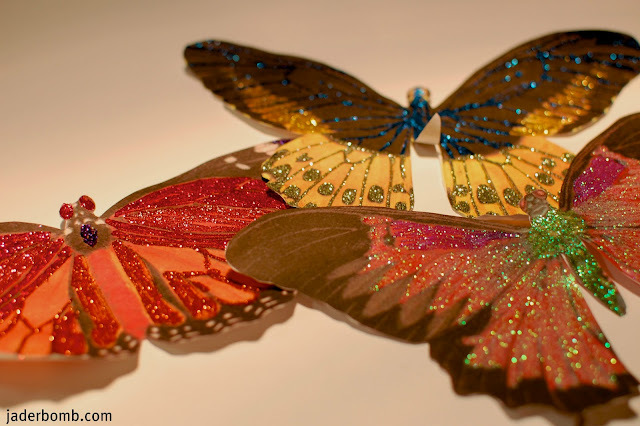 When I think of Fall I think of butterflies. I imagine them zooming all around the pretty fall flowers. 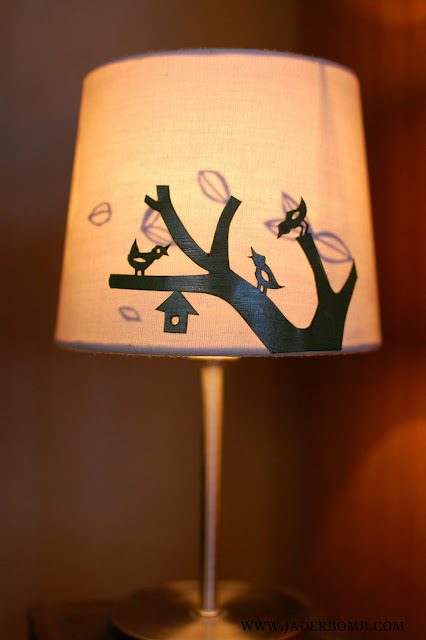 This craft is a hit for adults and children. You can dress up a wall with these, put them on a gift box, hang them from fishing string or just glue them onto a picture frame. Yes! 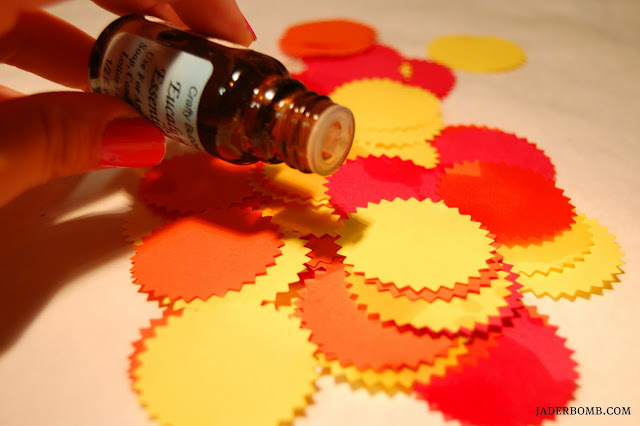 You too can make homemade confetti using your Martha Stewart punches. I think this year I will make a pile of different punches. You could even put these in little bags for your sock drawer, hang them in your car or give them as a gift! Anyone will love these. Last but not least. When I think of FALL I think of these smells: pumpkins, cinnamon, harvest, leaves and cloves. What better way to enhance the air you breathe! 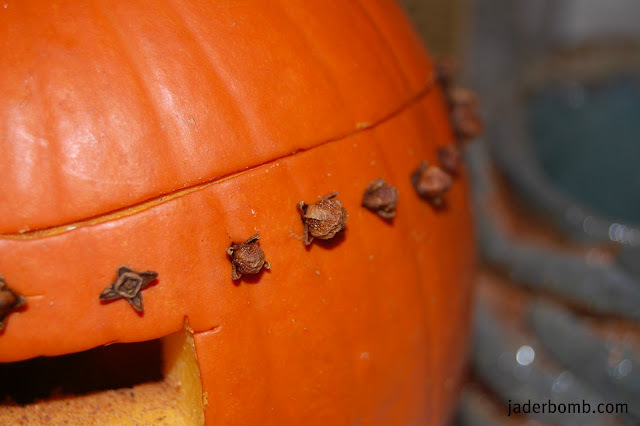 You can even create a design on the pumpkin with the cloves! I hope you had fun looking back on some cool crafts I did last year! Make sure and come back later for your FREE FLEUR DE LIS PRINTABLE! Hurricane Isaac is OVER and Jaderbomb is back.